Does things work now? Apparently, it does. Sounds like I'm talking to myself. In the process, comments were also wiped out via the same glitch, although the notice below from Blogger's own website issued the status as a less acute, "temporary removed." That sure was the weirdest thing. I reposted my Thursday post, BUT all the comments were gone. 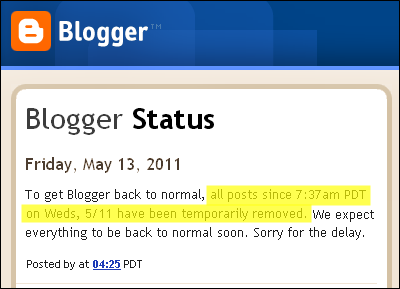 Funny thing is other people mentioned different sites being down other than Blogspot. I wonder how come all at once. Massive virus? Well... keeping my fingers crossed that it's safe now. Kay- the PR agency for Facebook (Burson-Marsteller) was just caught running a covert anti-Google smear campaign. Google owns Blogspot, so the incidents might be related. I read on their blog that they purposely removed all posts and comments after Wednesday and they'll be restoring them themselves, eventually. 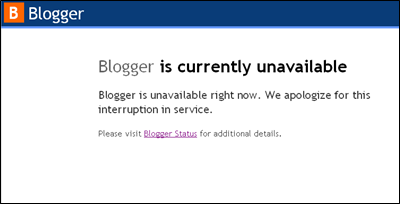 I've never seen Blogger down before and I've been using it for about two years, so I can't complain. Brad- plus the hosting's free. I was on TypePad from 2004-2008 for $14.95/month. 14.95 a month? LOL. Not worth it when you can get it hosted for free here. I keep wanting to move to another service for additional features, but then I realize how much I'm saving by just staying on Blogger and I change my mind.